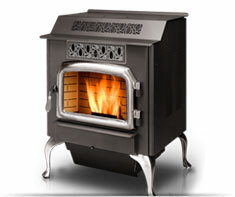 A Pellet Stove is different than a Wood Stove, which also has a closed metal box, but a Wood Stove will burn full wood logs, rather than wood pellets. Shown in the 'Routine Care' section are the recommended routine maintenance tasks for your pellet stove. The 'Q & A' section shows answers to common questions. And the 'Articles' section provides helpful articles about your pellet stove.